Our Automatic Pouch Packing Machines are widely produced for our company by using the highest grade raw materials for wrapping the many types of food items. 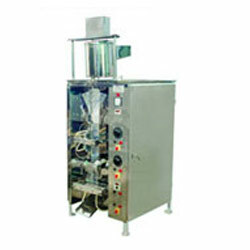 Our Automatic Pouch Packing Machine is immensely demanded in numerous industries such as food & beverage industries, consumer goods industries and cosmetic industries in India. We fabricate them with the finest quality materials, employing contemporary technology in compliance to the industry set standards. They are formally checked on many parameters at our quality check department and we offer them at market leading rates. Their automatic and precise functionality, volume adjustment feature, and speed regulating as well as accurate IC controls for accurate quantity content filling aspect these machines are greatly demanded in the market. Especially we were most popular among the cities like Mumbai, Pune, Vadodara, Hyderabad, Coimbatore and Chennai etc. These machines offer excellent output, require less maintenance and are power efficient as well as long-lasting. Also, used for packaging Chips, Kurkure, Namkeen, Pulses, Tablet, Granule. 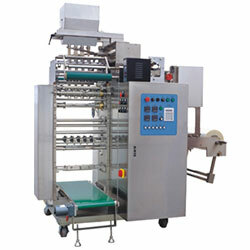 Output From 20 packs / min up to 95 packs / min depending upon product flow characteristics and pack size.